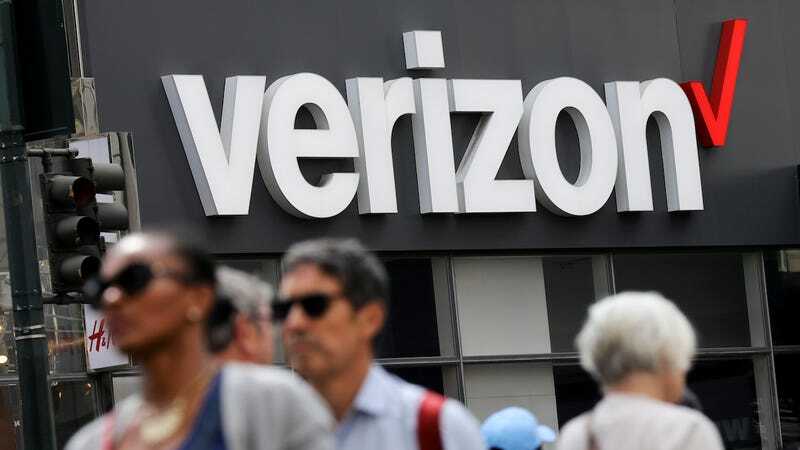 Like bankers on a balcony, sipping champagne and sneering at a growing crowd of protesters angrily chanting from the gutters below, Verizon has taken to openly giving the finger to the throngs of Americans online desperate to defend net neutrality. Ajit Pai, chairman of the Federal Communications Commission, drew laughter and applause from a crowd of telecom industry VIPs during an off-camera ceremony last week. In a video skit that played during Pai’s speech, Kathy Grillo, a Verizon senior vice president, took part in a joke about how her company planned to install Pai as a brainwashed “Verizon puppet” to head the FCC. Now the company is telling reporters it found the whole thing hilarious. “We never knew Kathy was so funny,” Jim Gerace, Verizon’s chief communication officer, told CNET reporter Chris Matyszczyk on Saturday. Reached by Gizmodo this morning, Gerace declined to say whether Verizon had a hand in writing the skit. “I really have nothing more to say about it,” he said. Outside the so-called “Telecom Prom” at the Washington Hilton last Thursday night, where industry insiders hobnobbed and threw back drinks with the federal employees supposedly charged with their oversight, dozens of people stood out in the cold protesting the FCC’s chummy relationship with Verizon and its competitors—each of which stand to profit when the FCC relinquishes its authority this week to regulate how the companies sell and deliver internet access to millions of US households. The annual gathering, hosted by the Federal Communications Bar Association, is often compared to the White House Correspondents Dinner (WHCD) thanks to the expectation that the guest of honor mix self-deprecating humor into their speech. The difference between the two events, of course, is that the president of the United States has no power to exert control over the WHCD’s journalist attendees—not that he hasn’t expressed his desire to do so. In the end, it isn’t the content of the skit that’s so disturbing. Nor is it the fact that the jokes took place in a semi-closed setting days away from the FCC’s vote to kill net neutrality. It’s the fact that it exists at all. But who did Pai call when he needed to produce material for this baptism by laughter? Verizon. Who jumped at the opportunity to lend him a hand? Verizon. And who thought it was safe to mock the millions of Americans who’ve lost faith in the FCC’s ability to hold the internet’s gatekeepers accountable? You get the picture. At the taxpayer’s expense, a powerful federal official tried to turn the allegations of corruption plaguing his office into a punchline. But he revealed a lot about himself in the process. The scene of him high-fiving a senior executive of a company he’s accused of being in bed with isn’t something the internet will soon forget. America isn’t laughing, even if Verizon can’t help itself.